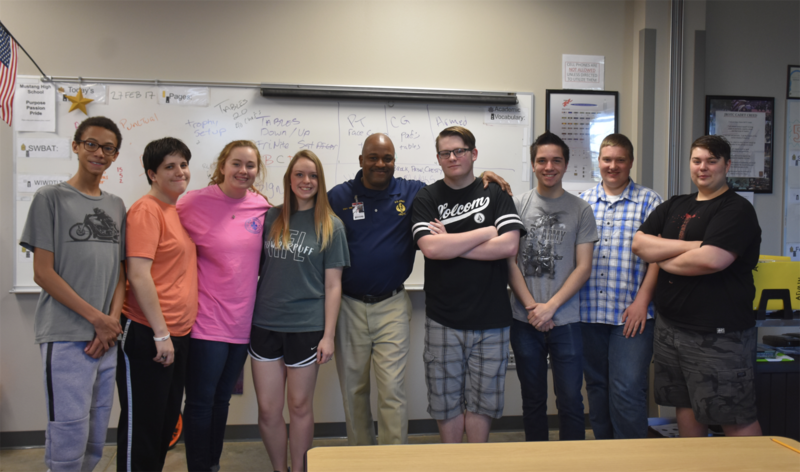 One of two Teachers of the Year for Mustang High School, Chief Omar Jones, didn’t say that he was “humbled by the honor” of being chosen. He said, “They made a mistake.” He reasoned that as one of two JROTC instructors of a nationally recognized program, there won’t be any questions on an ACT test from his class. JROTC is a leadership class. It teaches perseverance in the face of adversity, team work and good decision making. He asked his students to help him fill in the blank on one of his Teacher of the Year forms. He asked the kids, “What do I teach you?” They agreed; Jones teaches them life. He has a lot of experience to draw from. Jones, an African-American, was born in Los Angeles but grew up largely in Toledo, Ohio. Money was hard and the family moved a lot. School wasn’t difficult for him and after graduation, he went to college at Bowling Green on an athletic scholarship and was in the Army Reserves. Then he discovered girls. Since he didn’t work and he no longer went to school, she told him to figure out something else and it wouldn’t be at home. In retrospect, he can say it was one of the best things that happened to him, but at the time, his friends were getting killed on the rough streets of Toledo or going to prison. When Jones himself got in trouble with the law, it changed everything. He’s lived in seven countries and 13 states over a career of nearly three decades. He earned his way to Chief Warrant Officer four. The military may have saved his life, but he doesn’t credit it with all his success. He grew up with her family. Felecia was different. She had plans. She didn’t take anything off Jones and wasn’t afraid to put him in his place. They never really dated, but when he came back on his first visit home, he asked her to marry him. She tracked down his phone number and called to ask if the offer was still good. Ninety-six hours later, they were married. His motto and the reason why he teaches is simple: “I owe.” He said he owes people who came before him like 2nd Lt. Henry O. Flipper, the first African-American graduate from West Point. He owes Bill Cremean, Jack Thompson and Brad Hathaway, coaches and teachers from Toledo. Jones wanted to do the same thing for other struggling teens. His experience in an urban school district was shocking. One day while serving as a substitute, he called an administrator for help with an unruly classroom. The assistant principal said it wasn’t her job. In Jones’ world, you never let a new officer struggle. Saying “it’s not my job” was unconscionable. He followed her down the hall, telling her that in no uncertain terms. He decided to go ahead and “finish the thing” and headed for the principal’s office to express his feelings to him as well. Jones grew up in an area that was, and is still, racially charged. In many places, prejudice is not dead, particularly in the inner cities of Toledo. His dream was to work in the inner cities, like places he grew up, to find the kids who were giving up and to show them they could make it. No, he did not intend to apply. Felecia, a preschool teacher, was about to give Jones a lesson. “That’s not what I …” he began. He couldn’t argue. He drove to Mustang, resume in hand but without an appointment. A week later he got the call. “Any success I enjoy is not because of me. It’s because of my wife,” he said. He now teaches in one of the elite JROTC programs in the country. No, the students by and large don’t look like him, but they talk about race and dispel stereotypes together. They’re his kids now.